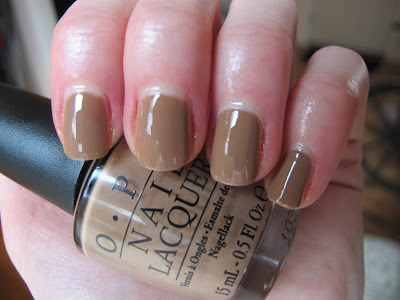 Never Enough Nails: Polish of the Week: OPI San Tan-tonio from the Texas Collection! Polish of the Week: OPI San Tan-tonio from the Texas Collection! Mmmmmmmmmm, doesn't this look like coffee with a fair amount of cream? Yummm! The Polish of the Week is OPI San Tan-tonio from the Texas collection. This is the only polish I have from Texas right now, but I'll probably get Houston, We Have a Purple too. As a whole, the collection didn't grab me. San Tan-tonio has been calling to me ever since I saw the promo pics though! San Tan-tonio is a very smooth tan color, I think it's like a coffee with lots of cream color. This is three coats, but I think two would suffice for daily wear. I kind of messed up applying this on one nail and thought it would be all lumpy, but it levelled itself out! Gotta love OPI! This isn't the kind of remarkable polish I usually gush about and propose marriage to, but I think it's a great polish staple to have in your wardrobe. San Tan-tonio gets an 9/10 from me!